The regulatory cost of doing business in Illinois remains the highest in the Midwest for workers’ compensation, according to the 2016 Oregon Workers’ Compensation Premium Rate Ranking study. Illinois’ out-of-balance workers’ compensation laws contribute to the Land of Lincoln’s loss of industrial investment and blue-collar job opportunities. Illinois manufacturing firms often cite workers’ compensation as a primary reason for the loss of rewarding industrial job opportunities in Illinois. And taxpayers cover the cost of workers’ compensation for government employees and for workers on public construction projects, making workers’ compensation an important government budgetary issue. The Oregon study ranks all 50 states plus Washington, D.C., for average workers’ compensation costs. According to the study, Illinois ranks as the most expensive state in the region, and ties with Oklahoma as the seventh-most-expensive state in the country. Illinois’ average cost is $2.23 per $100 of payroll, though costs within Illinois vary substantially among different industries. Other states in the region ranged from 12th-most-expensive in the country (Wisconsin) to 50th-most-expensive (Indiana). Illinois has ranked as the most expensive state in the region every year since the 2010 Oregon study. While a state’s average cost per $100 of payroll is the best overall indicator of each state’s relative competitiveness, the average gives only a partial view of the situation within each industry. Industry-specific cost comparisons provide a more complete view of the regulatory cost differences between states, and reveal that Illinois is especially uncompetitive with surrounding states in several blue-collar industries. The state of Oregon began producing its biennial study in 1986 as a way to assess and address problems within its workers’ compensation system. Oregon has continued producing the report in all even-numbered years since 1986, and the most recent iteration of the study is based on workers’ compensation premium rates in effect as of January 2016. The study produces an index rate for each state, which is a type of weighted average of workers’ compensation costs across industries using a consistent mix of 50 occupation classifications for all states. This control of occupation classifications allows for an apples-to-apples comparison between state averages without having to worry about the various weightings of different industries in each state. As a result, the interstate variance in industrial composition and occupational hazards does not skew the rankings. Furthermore, comparing the cost of workers’ compensation per $100 of payroll controls for different wage rates in different areas of the country. Just because a state has higher wages does not mean that state should have higher premium rates. That’s because premium rates are taken as a percentage of wages, which factors in how high or low wages are. In other words, a premium rate of $2 per $100 of payroll on an $80,000 worker produces twice the amount of premium as the same premium rate does on a $40,000 worker. Thus, the difference in wage rates between states is not a factor in the Oregon comparisons because the rates are essentially a percentage of overall payroll, which accounts for whether wages are high or low. Illinois’ position in the rankings has varied significantly over the last dozen years, and has been especially uncompetitive since 2008. As recently as 2004, Illinois ranked in the middle of the pack nationally with the 23rd-most-expensive system in the U.S., nearly equal to the study’s median rate and lower than regional competitors Ohio, Kentucky, Minnesota and Missouri. However, former Gov. Rod Blagojevich’s 2005 legislation contributed to higher costs in Illinois, making the state significantly less competitive. Illinois rose to the 10th-most-expensive state by 2008 and third-most-expensive in 2010. 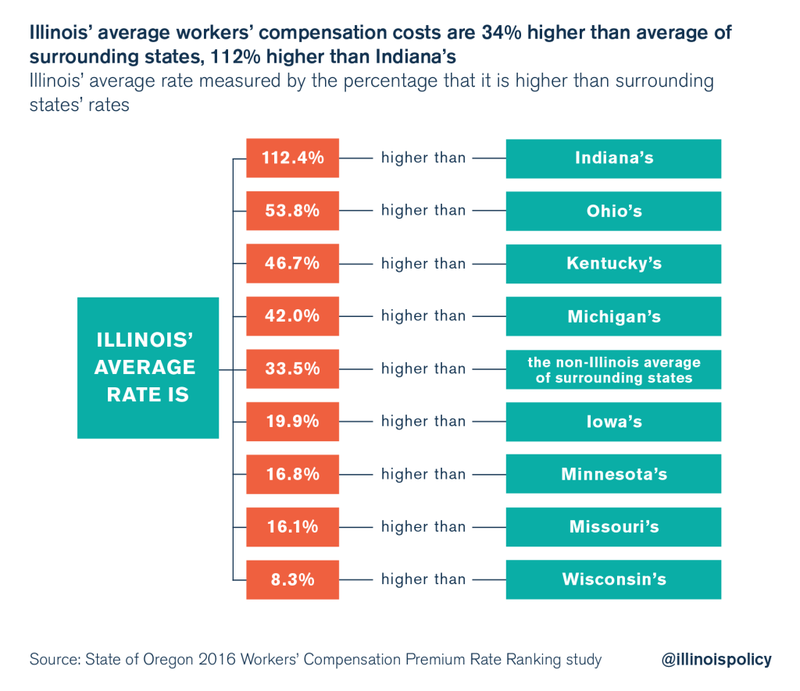 Despite enacting cost savings legislation in 2011 – legislation that fell far short as a measure to put Illinois in line with surrounding states – Illinois was the fourth-most-expensive state for workers’ compensation costs in 2012. In the 2014 study, Illinois ranked seventh-most-expensive, and has tied for the seventh-most-expensive state in the 2016 rankings. Workers’ compensation cost averages tend to decline across all states over time, making the rankings between states the most salient indicator of each state’s relative industrial competitiveness. One major contributor to declining workers’ compensation costs across states is safer workplaces. For example, between 2004 and 2014, Illinois’ workplace illness-and-injury incident rate per 100 workers declined to 3.2 incidents per 100 workers from 4.7 incidents per 100 workers, according to the Bureau of Labor Statistics’ survey of occupational injuries and illnesses. This represents a 32 percent reduction in the rate of injury and illness over just 10 years. Furthermore, a changing industrial makeup contributes to lower average costs across states, especially in states that are losing blue-collar production jobs and gaining white-collar service jobs. For example, from January 2004 to January 2014, Illinois saw a 17 percent reduction in the number of manufacturing jobs and a 28 percent reduction in the number of construction jobs. Over the same time period, Illinois also saw a 22 percent increase in education and health services jobs and a 16 percent increase in business services jobs. When service jobs replace production jobs, low-risk work replaces riskier work, and a state’s average cost for workers’ compensation declines. The fact that states such as Illinois lose so many manufacturing and blue-collar production jobs actually contributes to a lower average workers’ compensation cost within those states. And when Illinois loses out on manufacturing investment because of high workers’ compensation costs, that drives down the state’s average workers’ compensation rate because the state adds fewer risk-intensive jobs than it otherwise would have. All else being equal, the shift of jobs to service industries from production industries results in a state’s average workers’ compensation cost declining even though the actual cost of workers’ compensation for a given job classification does not change. 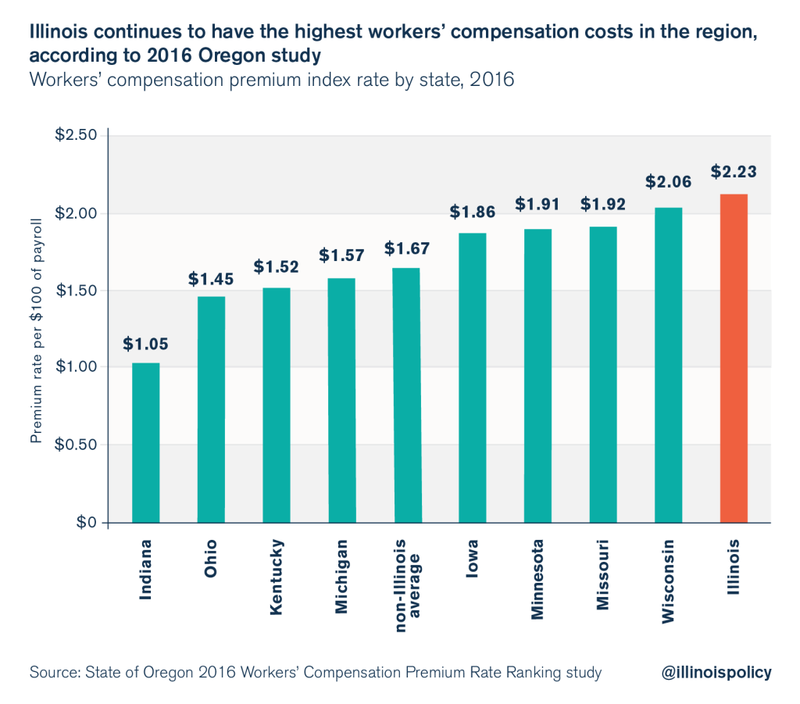 The 2016 Oregon study found that Illinois’ average cost for workers’ compensation is $2.23 per $100 of payroll. That means that for every $100 the average employer in Illinois spends on payroll wages, the employer pays $2.23 for workers’ compensation insurance. In effect, the mandatory workers’ compensation insurance acts like a tax on payroll wages with an average rate of 2.23 percent in Illinois. Illinois’ average workers’ compensation costs as a percentage of payroll are significantly higher than rates in most states in the region. Illinois’ average rate ranges from 8 percent higher than Wisconsin’s to 112 percent higher than Indiana’s. Compared with the average of nearby states, Illinois’ average rate is 34 percent higher. Specific industry comparisons show the workers’ compensation cost difference between Illinois and surrounding states can be significant in blue-collar industries. The 2016 Oregon study summary has not yet laid out an occupation-by-occupation breakdown for workers’ compensation costs. However, the 2014 Oregon occupational cost comparisons are still relevant, given that the overall averages didn’t change significantly across states from 2014 to 2016. For riskier job classifications, the 2014 Oregon study showed major cost differences between Illinois and other states. For example, the 2014 premium rate for concrete construction workers in Illinois was $21.91 per $100 of payroll, more than double the average of surrounding states. This is a clear example of how workers’ compensation drives up costs for both private industry and for taxpayer-funded public works projects. 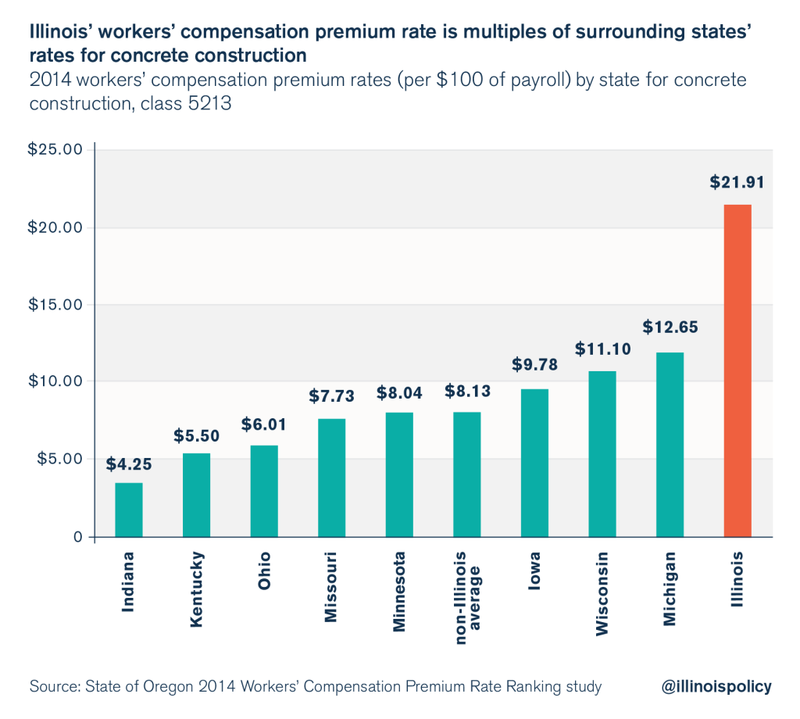 The workers’ compensation cost for concrete construction adds 22 percent to total payroll costs in Illinois, compared with adding an average of only 8 percent to total payroll costs in surrounding states. 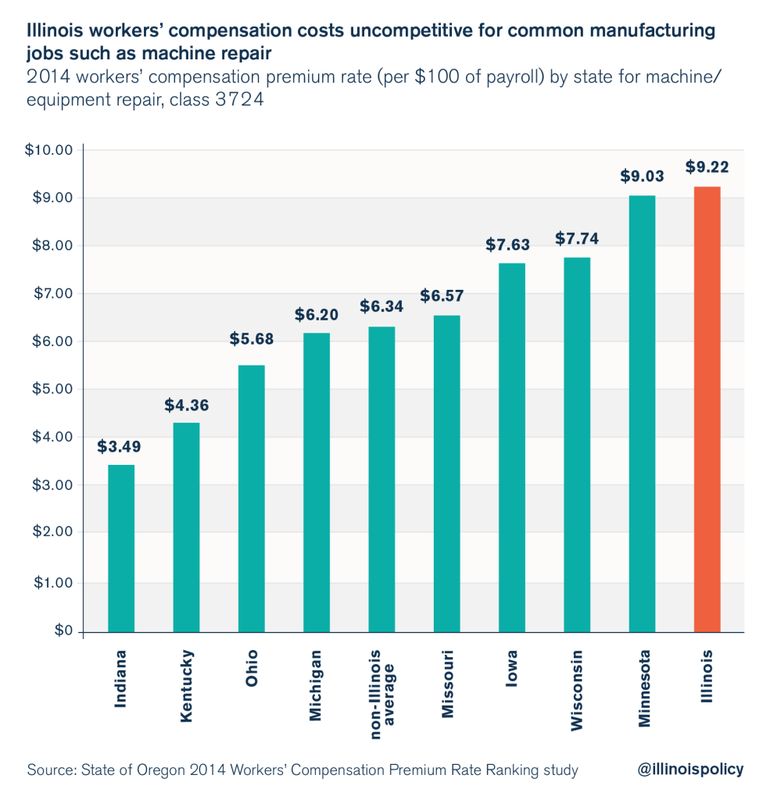 Manufacturers also face prohibitively high costs for workers’ compensation in Illinois compared with other states. One example from the 2014 study is for equipment- and machine-repair manufacturing workers. The premiums in Illinois are 45 percent higher than the average of surrounding states, and 164 percent higher than in neighboring Indiana. An Illinois machine- and equipment-repair manufacturer can save nearly 3 percent on total payroll costs by moving to an average state like Michigan, and can save nearly 6 percent on total payroll costs by moving to Indiana. This can result in a cost difference of hundreds of thousands or even millions of dollars per year between Illinois and other states. Long-distance truck driving is another industry where employers have a significant financial incentive to locate their drivers outside of Illinois. 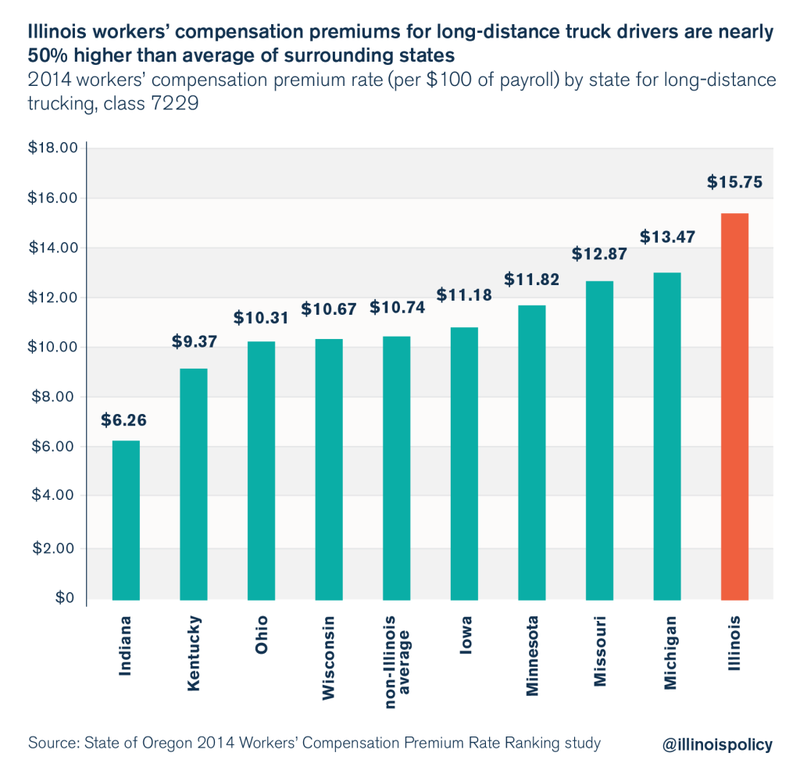 Workers’ compensation costs for long-distance truck drivers in Illinois are 47 percent higher than the average of surrounding states. Illinois employers can save nearly 5 percent on total payroll costs by moving to an average state like Wisconsin, and can save nearly 10 percent on total payroll costs by moving to Indiana. This is more than enough to make an employer choose a different state, all else being equal. Illinois’ workers’ compensation system forces prohibitively expensive costs on employers without providing significantly better benefits for workers. This can drive the decision to locate new investment and facilities in Illinois or in some other state. The Illinois Manufacturers’ Association has been outspoken on the issue, describing in detail how workers’ compensation laws cost Illinois new investment and production jobs. And individual manufacturers such as Hoist Liftruck President and CEO Marty Flaska have stated that they left the Land of Lincoln due to the cost of workers’ compensation. Repeal the majority of Blagojevich’s 2005 workers’ compensation law. Tie the medical fee schedule to Medicare reimbursement rates or private insurance reimbursement rates. Prohibit physician dispensing of medication beyond the first few days of an injury, which would eliminate the financial incentive for doctors to overprescribe opioids. Put Illinois’ maximum wage-replacement rate in line with other states’ by capping it at 100 percent of the state’s average weekly wage. Put Illinois’ minimum wage-replacement rate in line with other states’ for temporary total disability, permanent partial disability and permanent total disability so workers do not receive effective pay hikes for being injured. Give more weight to American Medical Association guidelines in determining the amount of injury awards. Clarify the definition and application of “traveling employee” and what constitutes an injury arising out of or in the course of employment to limit judicial activism in interpreting the law. The 2016 Oregon study makes clear that Illinois’ reform efforts in 2011 failed to make Illinois competitive with other states. Workers’ compensation costs are still significantly higher in Illinois than in surrounding states, and are multiples of Indiana’s premium rates. The study also makes clear that Illinois political leaders should reform Illinois’ system in order to foster industrial investment and job creation, and to conserve tax dollars. Chris Day, Mike Manley and Jay Dotter, “2016 Oregon Workers’ Compensation Premium Rate Ranking Summary,” Oregon Department of Consumer and Business Services, October 2016. “Greg Baise Speaks to the City Club of Chicago,” Illinois Manufacturers’ Association, August 30, 2016. “About Oregon’s Workers’ Compensation Rate Ranking Study,” Oregon Department of Consumer Business and Services, accessed October 27, 2016. “Oregon Workers’ Compensation Premium Rate Ranking, Calendar Year 2004,” Oregon Department of Consumer and Business Services, May 2005. Michael Lucci, “Illinois Became Less Competitive after Blagojevich’s 2005 Workers’ Compensation Bill,” Illinois Policy Institute, January 19, 2016. “Oregon Workers’ Compensation Premium Rate Ranking, Calendar Year 2008,” Oregon Department of Consumer and Business Services, Central Services Division, March 2009. “Oregon Workers’ Compensation Premium Rate Ranking, Calendar Year 2010,” Oregon Department of Consumer and Business Services, Central Services Division, February 2011. “Oregon Workers’ Compensation Premium Rate Ranking, Calendar Year 2012,” Oregon Department of Consumer and Business Services, Central Services Division, February 2013. “Table 6. Incidence Rates of Nonfatal Occupational Injuries and Illnesses by Industry and Case Types, Illinois, 2014,” Bureau of Labor Statistics, accessed October 27, 2016. “Table 6. Incidence Rates of Nonfatal Occupational Injuries and Illnesses by Industry and Case Types, 2004,” Bureau of Labor Statistics, accessed October 27, 2016. “Illinois Economy at a Glance,” Bureau of Labor Statistics, accessed October 27, 2016. “Oregon Workers’ Compensation Premium Rate Ranking, Calendar Year 2014,” Oregon Department of Consumer and Business Services, Central Services Division, February 2015. Doug Finke, “IMA Says Workers’ Comp Reform, Broader Sales Tax Base Will Help Manufacturing Jobs,” Springfield State Journal-Register, September 27, 2016. Austin Berg, “Manufacturer Moves Out of Madigan’s Backyard, Cites Unfriendly Business Climate,” Illinois Policy Institute, August 13, 2015. Michael Lucci, Mark Adams, “Workers’ Compensation Reform Means Jobs, Tax Savings,” Illinois Policy Institute, Spring 2016. “The Impact of Judicial Activism in Illinois,” Illinois Chamber of Commerce, 6.